Archives : PROFIT BOOKING SPOILS THE PARTY - 07/08/2009. PROFIT BOOKING SPOILS THE PARTY – 07/08/2009. As warned in the last article that inspite of a breakout, there will be no easy pickings for the traders as volatility will rise further. The worst fears seems to be coming true as the market is not able to sustain at higher levels and is giving away lot of its gains. This view was clearly explained in the last week’s article, that the market is behaving in the same way as it was behaving during the period when Sensex was around 8000 and Nifty around 2500. At that time the market gave lots of whipsaws and finally managed to make bottom. The same philosophy can be applied this time around and the market is expected to make an intermediate top. Traders and Investors always look out for reasons for any event that happens in the market. But in technical analysis we analyze the action and not the reason behind it. Anyway one of the main reasons behind the sell-off was selling by the FII’s. Bad news about a weak monsoon also accentuated the fall further. There is no reason to despair as now the indices both Sensex and Nifty enter strong support zone. In all likelihood we might see some pullback in the next week from the support zone Sensex 14888-14510 and Nifty 4420-4365. Sensex opened the week at 15694, made a high of 16002, made a low of 15104, and closed at 15160, thus registering a weekly loss of 566 points. On the weekly charts Sensex has formed a Bearish Engulfing Pattern with a slightly upper shadow indicating selling at higher levels. The Sensex has bounced from 13219, rose almost vertically to 16002 and is currently undergoing correction of this rise. The correction levels are 14939-14610-14282. Sensex has dipped this week and is now nearing support areas. 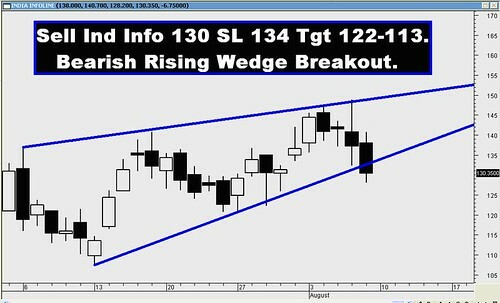 The Sensex has strong support at 14888-14786 which is the higher bottoms on the daily charts. Besides these there exists cluster of supports in this area for Sensex like the 38.2% retracement level of the previous rise and convergence of 50 DMA & 20DMA at 14800. Almost all the oscillators like the MACD is still in the positive and not given a Sell signal and the ROC is too above zero. The RSI is just about 50. So the oscillators don’t present such a bearish scenario. Trendline support for Sensex is at 14475. For the week ahead the Resistance is at 15332-15600-16002. Support is at 14888-14510-14016. Nifty opened the week at 4633, made a high of 4731, low of 4463, and closed at 4481. Thus the weekly loss was 155 points. Nifty has almost formed a Bearish Engulfing Pattern on the weekly charts with a slightly long upper shadow indicating selling pressure at higher levels. On the daily charts, Nifty has formed two identical Black Crows which is a Bearish Pattern. Nifty bounced from 3918, rose vertically to 4731 and is currently undergoing correction of this rise. The correction levels are 4420-4325-4228. Nifty has entered into major support areas in the very nearby range. The Nifty has strong support at 4420-4380 which is the higher bottoms on the daily charts. Besides these there exists cluster of supports in this area for Nifty like the 38.2% retracement level of the previous rise and convergence of 50 DMA & 20DMA at 4400. Almost all the oscillators like the MACD is still in the positive and not given a Sell signal and the ROC is too above zero. The RSI is just about 50. So the oscillators are not too bearish. Trendline support is at 4254. Strong CALL writing is visible at the strikes of 4700 which will act as a resistance in the very short term. The Nifty O.I.PCR has dropped to 0.98 but is still away from the oversold zone, but it clearly indicates Bearish nature of the market. For the week ahead, the Resistance is at 4558-4636-4731. Support is at 4420-4365-4325. Once again all the targets were achieved except OFSS. The star performer of the week was ABAN which went up by astonishing 16%.